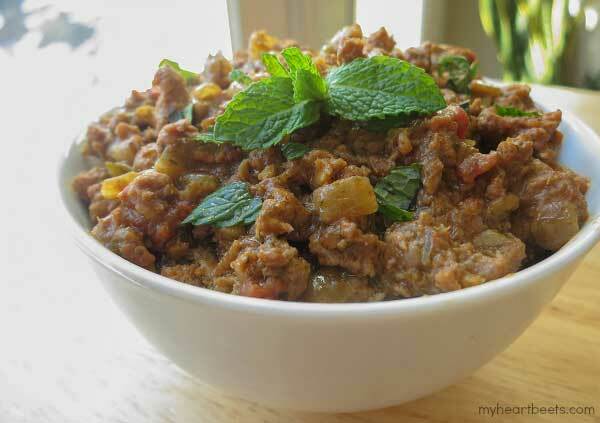 This Ground Lamb and Mint Curry is the FABULOUS result of having too much fresh mint in the house. I had mint. I needed to use it. I had lamb. I wanted to use it. Everyone knows these two make for a winning combo – so you know this is going to be a winning dish. I added some tasty spices like paprika, fennel and coriander to put make this minty curried dish a little more exotic. I also mixed in some diced tomatoes, which added sweetness and a serrano pepper for some heat. So… the reason we had a lot of mint in the house? My hubby, Roby, decided to make a mango-mint cocktail for my recent 28th birthday celebration (Here’s a pic on my instagram of him making it. Isn’t he handsome?). Lucky for us – he overestimated the amount of mint he needed (random aside: you know what I don’t get… why mint is somewhat expensive to buy and yet supposedly super easy to grow? I need to try to grow my own mint). Moving on… to make this dish, brown some onions in a saute pan and then add ginger, garlic, serrano pepper and spices. Add tomatoes then ground lamb. Once the lamb is almost done, add the creamy mint sauce and cook for several more minutes. Just a heads up, while this recipe calls for coconut milk – know that you won’t actually taste the coconut. The spices mask the flavor and so adding the milk just gives this dish a creamy flavor – it’s delicious. 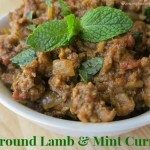 This lamb and mint curry is awesome with my paleo naan flat bread. And, you can make both the naan and this curry with ONE can of full-fat coconut milk (because you need a total of 1 and ¾ cup to make both). Yep, I try my best to be awesome for you guys. Add oil and onions to a dutch oven or heavy pot over medium heat. Saute the onions for 15 minutes, or until they turn golden brown. Then, add the garlic, ginger and serrano pepper. Stir-fry for a minute. Add the spices, stir-fry, then add the tomatoes. Mix well and cover the pot for 5 minutes. While that’s cooking – combine the coconut milk and fresh mint in a blender – and blend. Set the sauce aside for now. 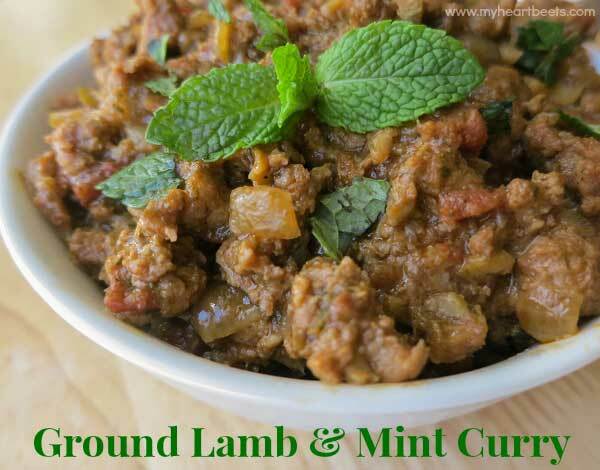 Add the ground lamb to the pan and once it’s completely browned and cooked through, add the mint sauce you just made. Cook for another 5 or so minutes, garnish with more mint and serve. Made this recipe. It was very delicious. It’s definitely a dish I will make often. Thanks for posting. 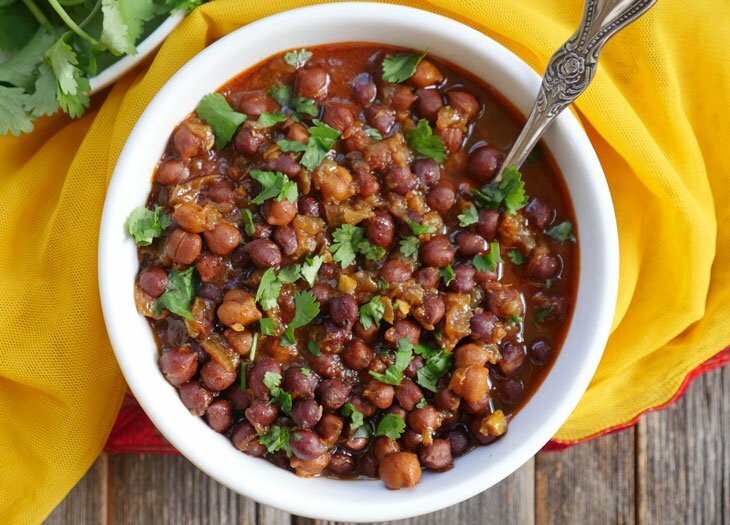 Hi, I am planning on making this tonight but was wondering if I can substitute something I can find at my local grocery store for the Kashmiri chili powder? Thank you! P.S. Cant wait to try this AND the naan!!! Hi Casey, you can use cayenne but be sure to use less as it’s spicier than the Kashmiri chili powder. Let me know how it turns out for you! This was so delicious! The fennel is such a nice touch. The flavors balance so nicely. When I finished cooking this, it looked a little too watery. But thanks to the coconut milk, the sauce takes on a nice creamy texture once it’s been off the heat for a bit. I’m eating it for lunch now with some coconut lime cauliflower rice. Well done! Your blog has quickly become one of my favorites! Wow, thanks! So glad you liked the recipe 🙂 Hope you’ll let me know if you try any other recipes on my blog! Wow – just made this last night! It was amazing and so incredibly easy to put together. We made naan and also some cauli-rice seasoned with paprika, cumin, coriander and pepper. THANK YOU! I’m going to cook lamb for the first time. Can I know how long does it take to cook lamb and how do I know when it’s cooked? Can I know how long it takes to cook ground lamb? Cook it until the meat is brown! Just made this with fresh mint, pepper and tomatoes from my garden! It came together quick and easy (easily under 30min for the whole shebang). Very tasty! I featured your blog on a list of my favorite food blogs on my site! So great to find paleo Indian recipes – usually, I’m making modifications to my cookbook recipes – so I appreciate you’ve already done it for me! Fast and flavorful recipe – thank you Ashley! I used mint from my garden (very easy to grow but be sure to contain it, as it spreads like a weed). It’s a great weeknight recipe that’s would also be tasty and different for company. I had it with your naan (I keep extra in the freezer when I make a batch) and hubby had it over rice. A keeper that we will make again (and again). This is awesome!! I make it regularly and have given the recipe out to several friends who also have made it and loved it! Quick, easy, healthy, and tasty. This is a total win. Tremendous, easy, tasty recipe! Thanks for saving my weekend when my fridge was practically bare save some mint and ground lamb! So tasty! This quickly became one of my go-to weeknight meals when I get home late and crave something quick and nourishing. You’re a culinary genius, lady. Thank you! Awesome!! Thanks, Sarah 🙂 I’m so glad you like it!! This was outstanding. I used backyard mint and had it over cauli rice sautéed with red onions and Kalamata olives. Packed with flavor.